Traffic is once again flowing over the iconic bridge spanning Wadi Al-Kouf on the route linking Beida and Marj. It was closed Wednesday when concrete cracks were spotted. Road transport engineers inspected the bridge yesterday and said that it needed only emergency maintenance and was safe. The structure is now open for light traffic but local security officials are stopping heavily-loaded trucks from crossing in groups. 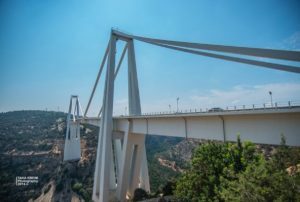 Until the 2004 completion of France’s Millau viaduct, the 52 year-old Libyan bridge was the highest of its kind in the world. Designed by the Italian civil engineer Ricardo Morandi it took Italy’s Construzioni Stradali et Civili six years to complete. In 1992, after ground movement affected the suspended midspan, the Wadi Al-Kouf bridge was given a major overhaul with strengthened cables and new bearings and joints.